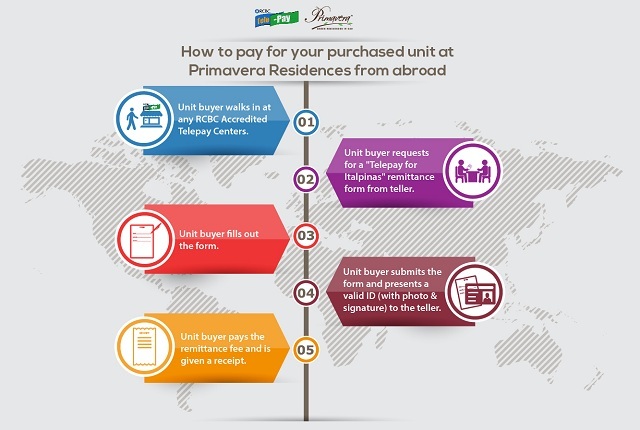 Buyers of Primavera Residences units now have an easy way to pay for their investment even when they are abroad. Italpinas Euroasian Design and Eco-Development Corp. (ITPI), the developer of Primavera Residences, has partnered with Rizal Commercial Banking Corp.’s (RCBC) Telepay money remittance unit to provide Overseas Filipino Workers (OFWs) with a convenient service that will enable them to make their monthly payments of purchased units through RCBC Accredited Telepay Centers in other countries. Paying through the RCBC Telepay remittance service is fast and easy. All the unit buyers have to do is go to any of the 2,300 RCBC Accredited Telepay Centers spread across Hong Kong, Singapore, Malaysia, Japan, US, Canada, Australia, Europe, and the Middle East. The unit buyer then fills out a form with his name, the unit/room number he purchased at Primavera Residences, and the amount of his monthly payment. Upon completion, the unit buyer presents the form along with a valid ID to the teller. The unit buyer pays the amount and is given a receipt. The RCBC Accredited Telepay Center abroad then transmits the payment and the details of the remittance to its RCBC Manila office. The RCBC Manila office confirms the remittance transaction then sends a system-generated report to ITPI. Once ITPI checks the report and verifies it with the bank remittance, the company sends a Statement of Account to the unit buyer. This convenient service is part of Primavera Residences’ commitment to provide only the best for its customers. Interested in owning a unit at Primavera Residences? Check out Primavera Residences’ condo units for sale. To see the list of RCBC Accredited Telepay Centers abroad, click here.